Click on links below images for medium and high-resolution jpeg images. When using these images, please credit each photo as indicated. The Muon g-2 ring successfully completed its third and final night of offsite moving on July 25 and 26, 2013. 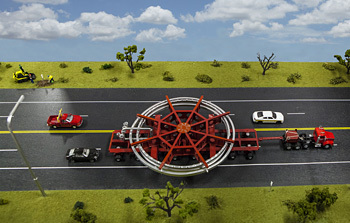 A time lapse of the transporter wheel mechanism shows the independent movement. Some of the material has been sped up 6 - 8 x for the sake of brevity. Credit: Fermilab. The barge transporting the Muon g-2 magnet makes its way up the Illinois River, and through the Peoria, Illinois locks and dams. Credit: Fermilab. Night one of the Big Move across the Illinois roadways. 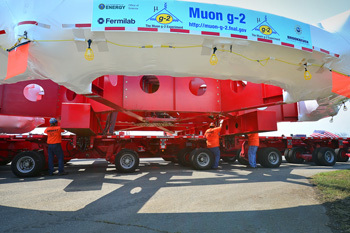 The Muon g-2 magnet was driven from Lemont, Illinois to a Costco parking lot in Bolingbrook, Illinois. Credit: Fermilab. After a long water journey, a crowd gathers in Lemont, Illinois to watch the Muon g-2 ring being lifted from the barge and onto the truck that will transport it to Fermilab. Credit: Fermilab. 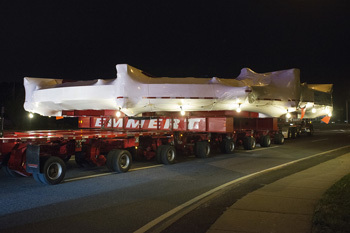 A five-minute compilation of scenes from the entire move of the Muon g-2 ring from Brookhaven National Laboratory to the barge at Smith Point Marina on Long Island, including the journey down the William Floyd Parkway in the early morning hours. Credit: Brookhaven National Laboratory, Fermilab. 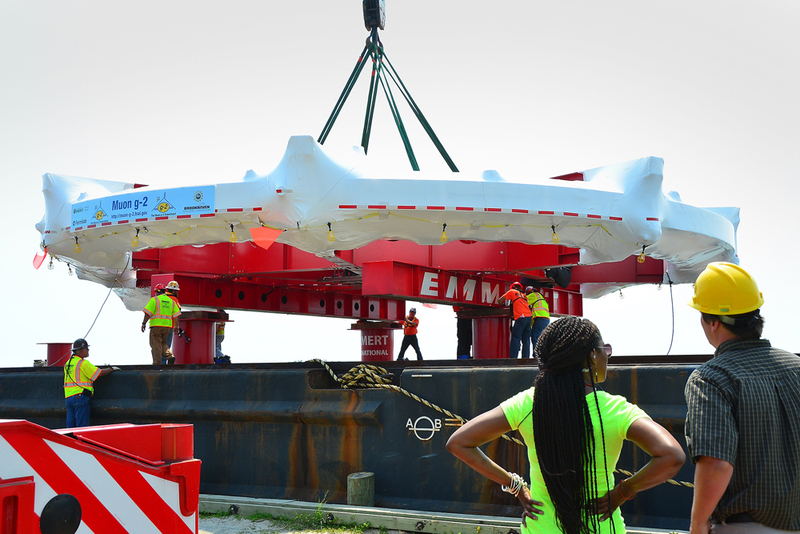 The Muon g-2 ring is carefully craned over to a waiting barge at the Smith Point Marina on Long Island on June 24, 2013. Credit: Fermilab. Footage of the Muon g-2 ring making its way down the William Floyd Parkway to the Smith Point Marina on Long Island in the early morning hours of June 24, 2013. Credit: Fermilab. 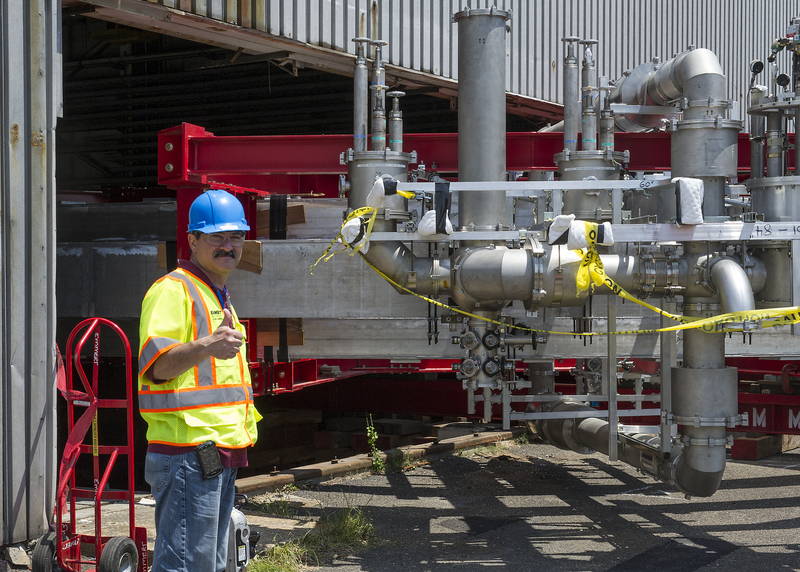 The Muon g-2 ring is transported across the Brookhaven National Laboratory site on Long Island on June 22, 2013. Credit: Fermilab. Animation simulating the truck transporting the 50-foot-wide Muon g-2 storage ring through the streets of Illinois. Credit: This video is copyright Emmert International. It is available for reporters to download and use. Hundreds crowd around the Muon g-2 magnet during the celebration on Friday, July 26, 2013 commemorating the end of the Big Move. Credit: Fermilab. The Muon g-2 magnet at rest in front of Wilson Hall at Fermilab in Illinois, after the completion of its 3,200-mile journey from Brookhaven National Laboratory in New York on Friday, July 26, 2013. Credit: Fermilab. 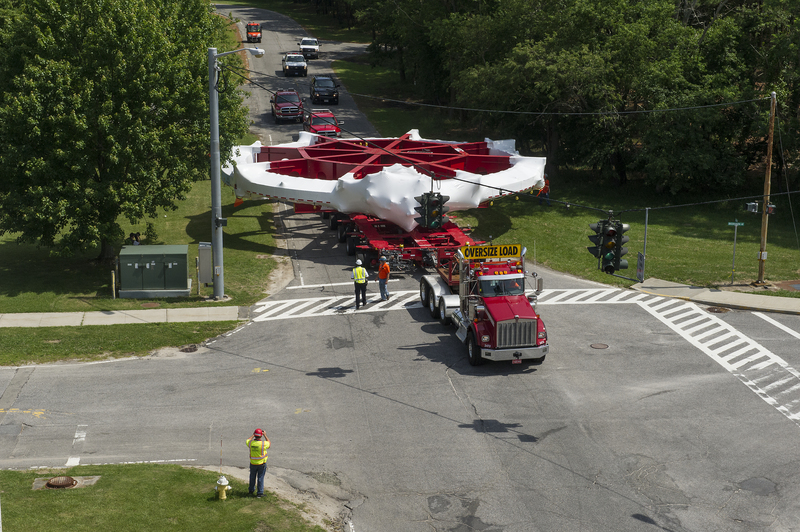 The Muon g-2 magnet makes its way toward Wilson Hall at Fermilab in Batavia, Illinois on Friday, July 26, 2013. Credit: Fermilab. 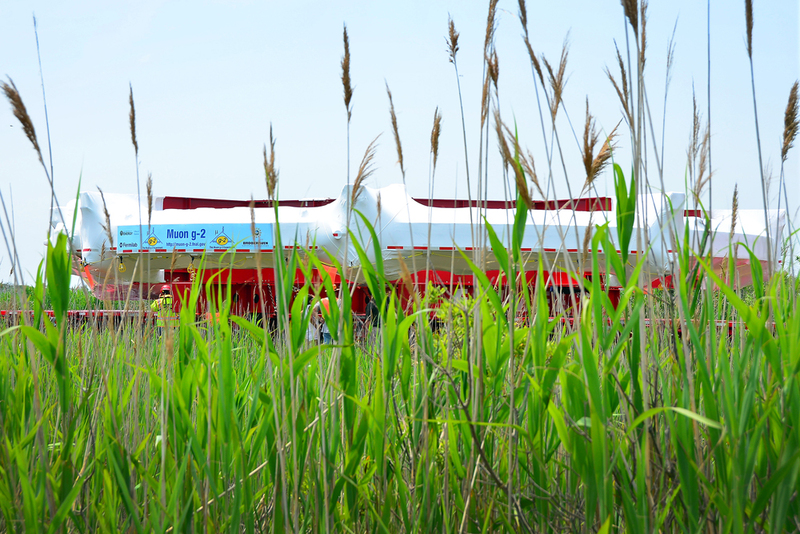 The Muon g-2 electromagnet rolls toward Wilson Hall at Fermilab in Batavia, Illinois on Friday, July 26, 2013. Credit: Fermilab. 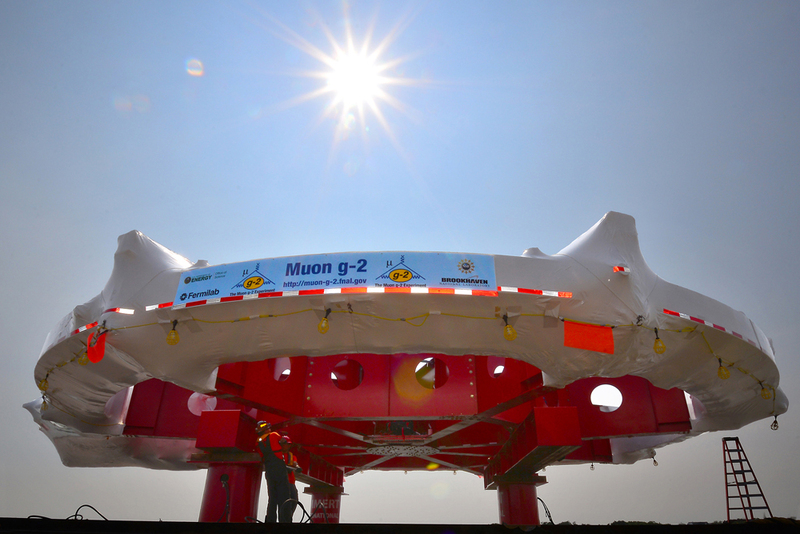 The Muon g-2 electromagnet enters the Fermilab property in Illinois at 4:07 am on Friday, July 26, 2013 after completing its 3,200-mile land and sea journey from Brookhaven National Laboratory in New York. Credit: Fermilab. 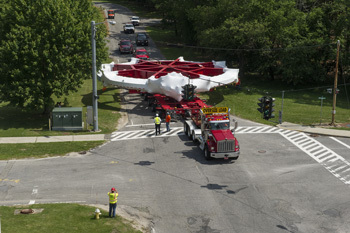 The Muon g-2 electromagnet makes its way north on Eola Road in Aurora, Illinois on Friday, July 26, 2013. The early-morning move along Eola Road was one of the trickiest parts of the transport. Credit: Fermilab. The Muon g-2 magnet backing up onto I-88 from Illinois Route 53 at around 11:30 pm on Thursday, July 25, 2013. With no westbound entrance to the tollway at this intersection, the driver backed up the off-ramp. Credit: Fermilab. Onlookers snap photos of the Muon g-2 electromagnet at the Hidden Lake Forest Preserve in Downers Grove, Illinois, shortly before the final night of the big move across the Illinois roadways on Thursday, July 25, 2013. Credit: Fermilab. 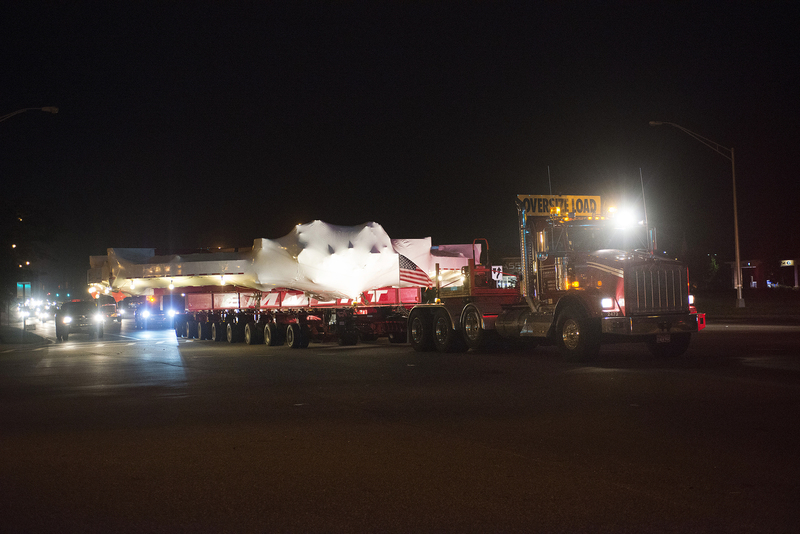 The Muon g-2 magnet rolls into its second stopover at Hidden Lake Forest Preserve in Downers Grove, Illinois, in the early morning hours of Thursday, July 25, 2013. Credit: Fermilab. The 50-foot-wide Muon g-2 electromagnet being driven north on I-355 between Lemont and Downers Grove, Illinois, shortly after midnight on Thursday, July 25, 2013. Credit: Fermilab. 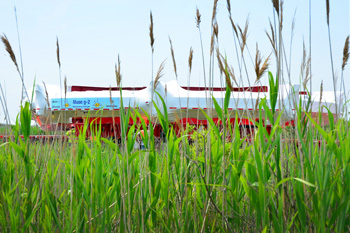 A crowd of onlookers surrounds the Muon g-2 magnet during its all-day stopover at Costco in Bolingbrook, Illinois, on Wednesday, July 24, 2013. 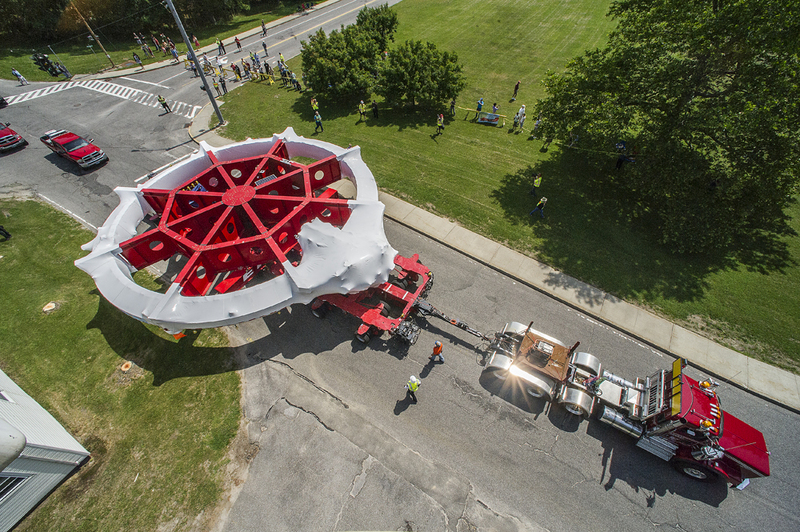 Thousands of people came out to look at the giant magnet during the day. Credit: Fermilab. The Muon g-2 electromagnet makes its way north on Lemont Road in Lemont, Illinois during the late-night hours of Tuesday, July 23, 2013. Credit: Fermilab. The 50-foot-wide Muon g-2 electromagnet slides under the I-55 overpass on Lemont Road in Lemont, Illinois during the late-night hours of Tuesday, July 23, 2013. Credit: Fermilab. Workers from Emmert International guide the 50-foot-wide Muon g-2 magnet up Old Lemont Road in Lemont, the first step on its big move across the Illinois roadways, on Tuesday, July 23, 2013. Credit: Fermilab. 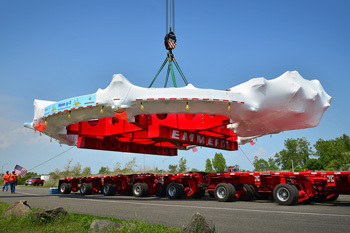 A giant crane is used to move the Muon g-2 electromagnet from the barge to the Emmert International truck that will drive it along the Illinois roadways. The crane move took place on Sunday, July 21, 2013 in Lemont, Illinois. Credit: Fermilab. The Muon g-2 electromagnet is lifted from the barge using a gigantic crane on Sunday, July 21, 2013 in Lemont, Illinois. Credit: Fermilab. The tugboat Miss Katie pushes the barge carrying the Muon g-2 electromagnet into port in Lemont, Illinois on Saturday, July 20, 2013. Credit: Fermilab. A barge containing the Muon g-2 electromagnet passes through the Chicago Sanitary and Ship Canal's fish barrier system near Lemont, Illinois on Saturday, July 20, 2013. Credit: Fermilab. The barge transporting the Muon g-2 electromagnet goes through locks on the Illinois River in Joliet, Illinois on Saturday, July 20, 2013. Credit: Fermilab. The barge transporting the Muon g-2 electromagnet makes its way up the Illinois River south of Pekin on Friday, July 19, 2013. Credit: Fermilab. The Muon g-2 electromagnet passes by the St. Louis Arch on its way to Fermilab in Illinois. The 3,200-mile land and sea journey took just more than a month. Credit: Fermilab. A look at the tugboat Miss Katie as it pushes the Muon g-2 barge out of the Rankin Lock on the Tennessee-Tombigbee Waterway in Mississippi. Photo: Darin Clifton, Ceres Barge. The tugboat Miss Katie pushes the Muon g-2 barge into the Rankin Lock on the Tennessee-Tombigbee Waterway in Mississippi. Photo: Darin Clifton/Ceres Barge. The tugboat Miss Katie pushes the Muon g-2 barge into the Fulton Lock on the Tennessee-Tombigbee Waterway in Mississippi. Photo: Darin Clifton/Ceres Barge. After switching tugboats in Mobile, the Miss Katie pushes the Muon g-2 barge up the Tennessee-Tombigbee Waterway. Photo: Darin Clifton/Ceres Barge. The tugboat Trident pulls the Muon g-2 barge into the Tennessee-Tombigbee Waterway north of Mobile, Alabama. Photo: Darin Clifton/Ceres Barge. The tugboat Trident pulls the Muon g-2 barge into Mobile Bay in Alabama. Photo: Darin Clifton/Ceres Barge. The Muon g-2 ring attached to the barge at the Smith Point Marina on Long Island, preparing for its sea voyage. 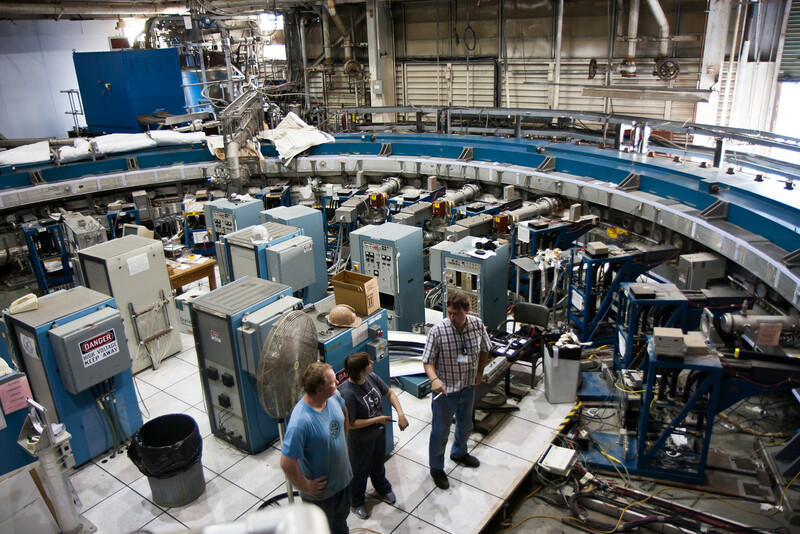 Credit: Brookhaven National Laboratory. 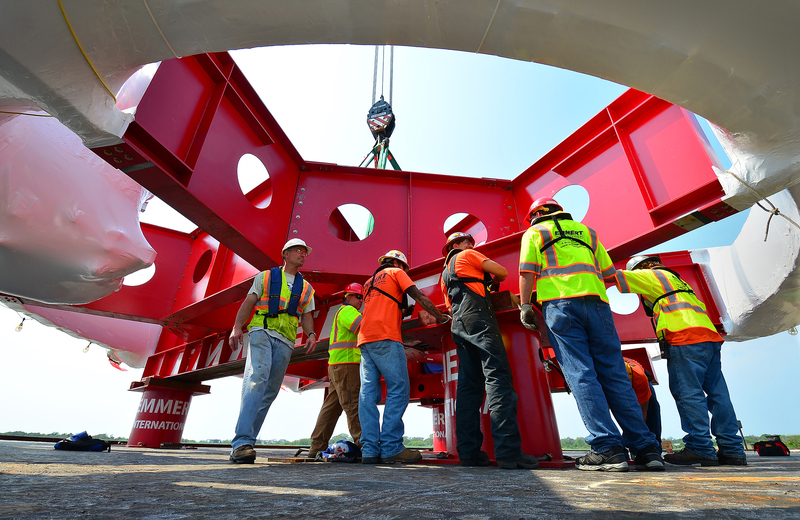 Workers from Emmert International secure the Muon g-2 ring to the barge at the Smith Point Marina on Long Island on June 24, 2013. Credit: Brookhaven National Laboratory. The Muon g-2 ring after being safely craned onto the barge at Smith Point Marina on Long Island on June 24, 2013. Credit: Brookhaven National Laboratory. 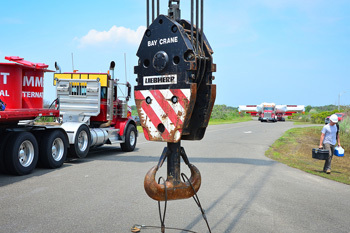 Crane operators carefully move the 50-foot-wide Muon g-2 ring from the specially adapted truck onto abarge at the Smith Point Marina on Long Island on June 24, 2013. Credit: Brookhaven National Laboratory. The Muon g-2 ring is lifted from the specially adapted truck at Smith Point Marina on Long Island on June 24, 2013. 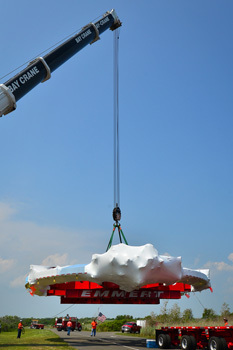 The entire apparatus weighs about 50 tons. Credit: Brookhaven National Laboratory. 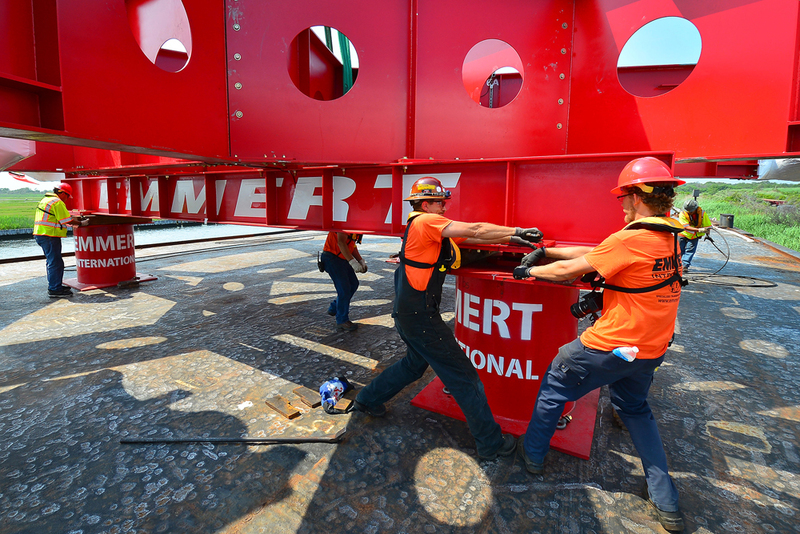 Workers from Emmert International secure a crane to the Muon g-2 ring in preparation for moving it onto a barge at the Smith Point Marina on Long Island on June 24, 2013. Credit: Brookhaven National Laboratory. 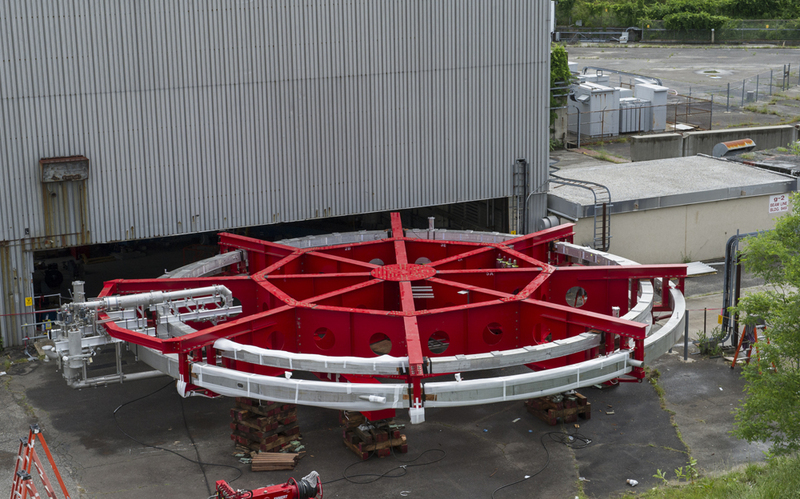 A heavy crane awaits the Muon g-2 ring, seen in the distance. The crane moved the 50-ton apparatus onto a barge at Smith Point Marina on Long Island on June 24, 2013. Credit: Brookhaven National Laboratory. 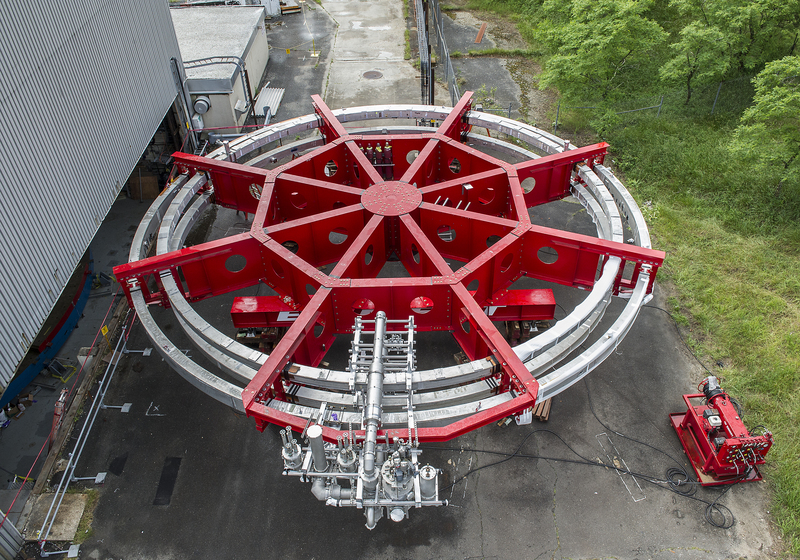 The Muon g-2 ring at Smith Point Marina on Long Island on June 24, 2013. Credit: Brookhaven National Laboratory. 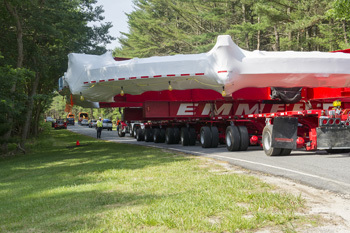 The 50-foot-wide Muon g-2 ring makes its way down the William Floyd Parkway on Long Island in theearly morning hours of June 24, 2013. Credit: Brookhaven National Laboratory. The Muon g-2 ring is transported across the Brookhaven National Laboratory site on Long Island on June 22, 2013. Credit: Brookhaven National Laboratory. The Muon g-2 ring, attached to a specially adapted truck, crosses an intersection on the Brookhaven National Laboratory site on Long Island on June 22, 2013. Credit: Brookhaven National Laboratory. The 50-foot-wide Muon g-2 ring makes its way across the Brookhaven National Laboratory site on Long Island on June 22, 2013. Credit: Brookhaven National Laboratory. 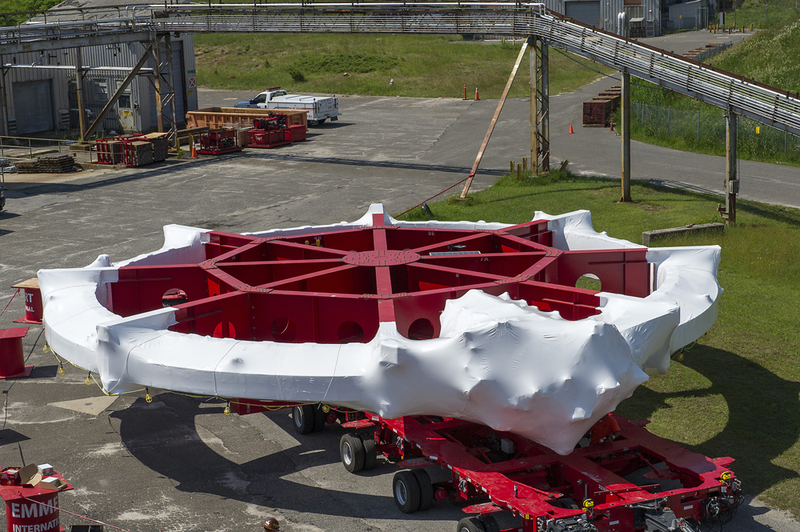 The 50-foot-wide Muon g-2 ring loaded onto a specially adapted truck and ready to be transported across the Brookhaven National Laboratory site on Long Island. 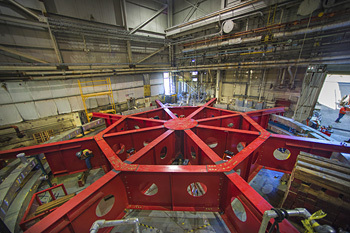 Credit: Brookhaven National Laboratory. 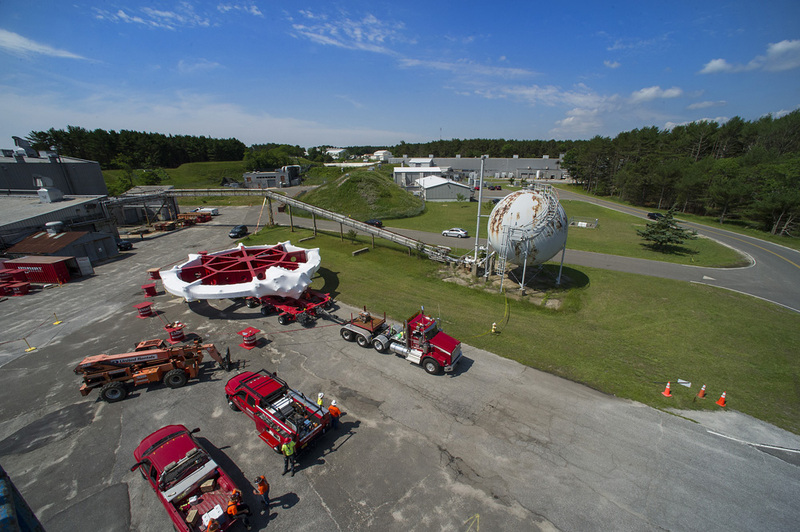 A bird�s-eye view of the Muon g-2 ring, wrapped in plastic and ready to be transported across the Brookhaven National Laboratory site on Long Island. 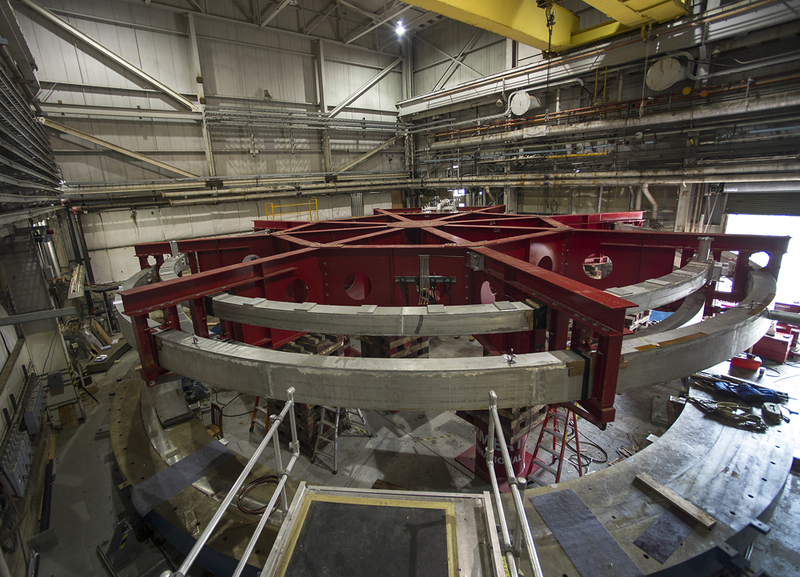 Credit: Brookhaven National Laboratory. 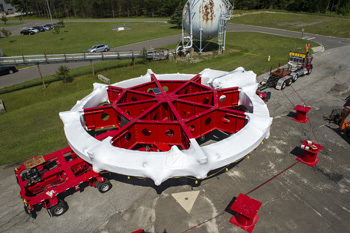 The Muon g-2 ring shortly after being removed from the building it has been in since 2001 on the Brookhaven National Laboratory site on Long Island. Credit: Brookhaven National Labortory. 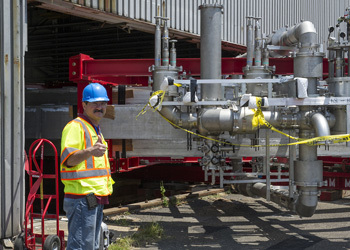 A worker gives the thumbs-up as crews from Emmert International carefully move the Muon g-2 ring out of the Brookhaven National Laboratory building it has been in since 2001. Credit: Brookhaven National Laboratory. Workers prepare to move the 50-foot-wide, 15-ton Muon g-2 ring out of the Brookhaven National Laboratory building it has been in since 2001. Credit: Brookhaven National Laboratory. The Muon g-2 ring, connected to the transport apparatus and ready to be moved for the first time since 2001. Credit: Brookhaven National Laboratory. 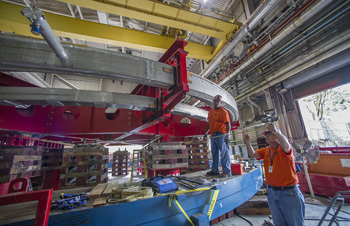 Crews work to attach the red stabilizing apparatus to the Muon g-2 rings at Brookhaven National Laboratory in New York in preparation for moving them over land and sea to Fermi National Accelerator Laboratory in Illinois. Credit: Brookhaven National Laboratory. 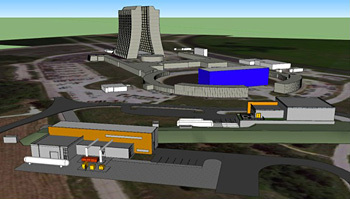 A model of the truck that will be used to transport the Muon g-2 ring, placed on a streetscape for scale. The truck will be escorted by police and other vehicles when it moves from Brookhaven National Laboratory in New York to a barge, and then from the barge to Fermi National Accelerator Laboratory in Illinois. Credit: Fermilab. 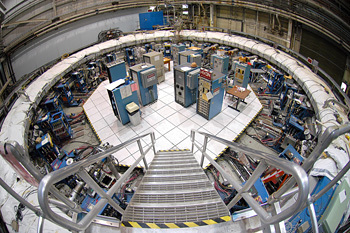 The Muon g-2 storage ring, in its current location at Brookhaven National Laboratory in New York. 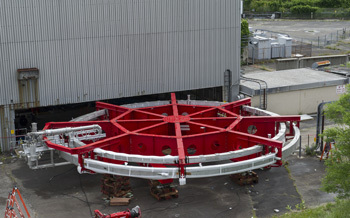 The ring, which will capture muons in a magnetic field, must be transported in one piece, and moved flat to avoid undue pressure on the superconducting cable inside. Credit: Brookhaven National Laboratory. Physicists stand inside the Muon g-2 storage ring, in its current location at Brookhaven National Laboratory in New York. The ring is 50 feet wide, and will be transported in one piece by barge and truck to Fermi National Accelerator Laboratory in New York. Credit: Brookhaven National Laboratory. Conceptual drawing of the buildings on the Fermilab site that will host the new Muon g-2 and Mu2e experiments. Credit: Fermilab.